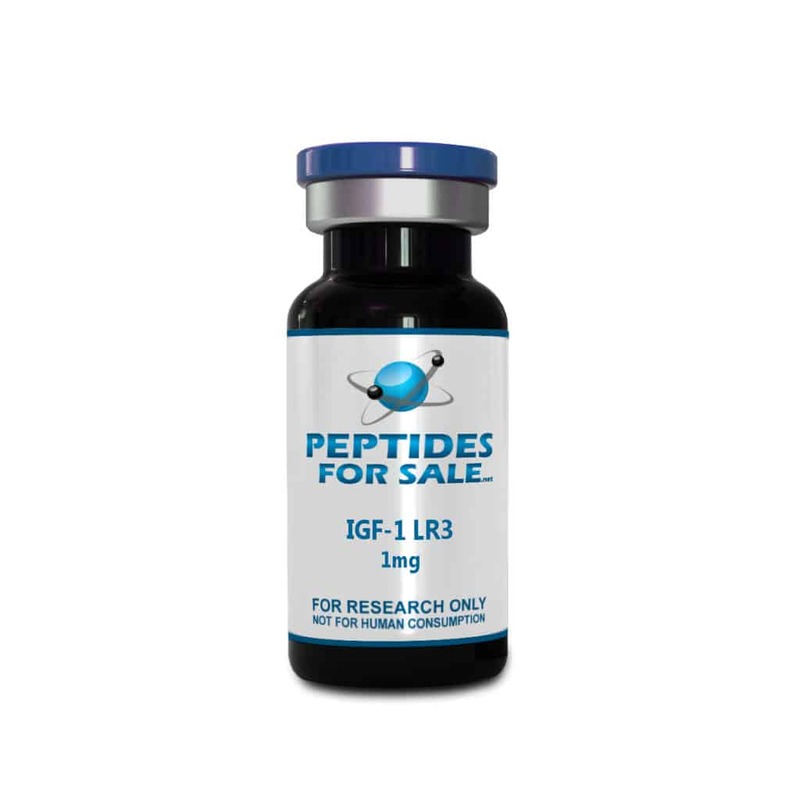 Buy IGF-1 LR3 at Peptides For Sale. For the best quality peptides and research chemicals, Peptides For Sale has what you need. IGF 1 LR3 goes by the technical name Insulin-like growth factor 1 or Somatomedin-C. Known as a protein, it has the genetic code as IGF1. Generally, IGFs help to enhance the growth and survival of several cell types like bone and muscle in an artificial environment, hence why IGFs are mitogenic polypeptide growth factors. Insulin and IGF-I share similar molecular structure. The importance of IGF-I is observed from childhood growth up to adulthood where it has anabolic effects. There are several applications of IGF-I; a synthetic analog known as Mecasermin is utilized for growth failure treatment. In some specific peripheral neuropathies, there is a likely reversal of degeneration of spinal cord motor neuron axon due to the therapeutic administration of neurotrophic proteins (IGF1). The structure of IGF-1 is similar to other peptides. Along with the 70 amino acids in a single chain in its structure, it also consists of 3 intramolecular disulfide bridge. IGFs help to enhance the growth and survival of several cell types like bone and muscle in an artificial environment, hence why IGFs are mitogenic polypeptide growth factors. Several tissues produce IGFs under different conditions and times, but the liver is the primary source of IGFs. It is a member of the Insulin Gene family alongside relaxin and insulin. IGFs and insulin share lots of similarities in terms of function and structure. The major difference between IGFs and insulin is the fact that IGFs have a higher growth-promoting activity between the two. While IGF-1 expression is influenced by growth hormone, that of IGF-2 is done by placenta lactogen. Tyrosine kinase type 1 receptor (IGF-IR) is the signal source of both IGF-I and IGF-II, although, IGF-II/Mannose-6-phosphate receptor is also the signal source for IGF-II. Along with the 70 and 67 amino acids respectively in their structure, Human IGF-I and IGF-II also consist of 3 intramolecular disulfide bridge. Insulin-like growth factor goes by many names; Somatomedin-C, IGF-I, IGF1, and Mechano growth factor. Like relaxin and insulin, the IGFs belong to the insulin family. They represent a group of structurally related polypeptide with varying degree of biological functions. The IGFs are a vital part of pre-adolescent mammalian growth. Insulin and IGF-I share similar molecular structure. In some specific peripheral neuropathies, there is a likely reversal of degeneration of spinal cord motor neuron axon due to the therapeutic administration of neurotrophic proteins (IGF1). Studies show that IGF1/IGF-I may act as a physiological regulator of glycogen synthesis in osteoblasts as well as [1-14C]-2-deoxy-D-glucose (2DG) transport. IGF1/IGH-1 enhance glucose uptake and transport in rat bone-derived osteoblastic (PyMS) cells even at lower concentrations than insulin. Defects in IGF1/IGF-1 result in IGF1 deficiency (Insulin-like growth factor 1 deficiency) which leads to mental retardation, and growth retardation.